RESTRICTION: Roof rack required for mounting. NOTE: Increase your cargo capacity with Thule Tracker II or Railing crossbar systems that attach to your factory roof rack. Product Description: The Thule 682 Sidekick roof top cargo box is one of our most popular sellers due to it's features, price, style, and Thule's reputation for quality merchandise. While slightly more expensive than the soft sided roof top storage bags, the hard shell cargo carriers offer lock and key security and better weather protection and durability. 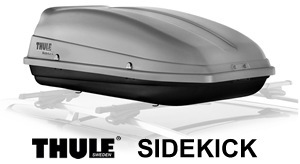 The Thule Sidekick luggage carrier is also sized within limits to be able to be shipped via UPS Ground service. That translates into faster delivery with Free Shipping. to vehicle roof. Folds to stow when not in use. - Less expensive alternative for carrying gear on your car. Wide selection of low priced cartop cargo bags. - Try our hitch mount cargo box carriers & flatbed racks. Easy loading at ground level and less wind resistance. roof racks to fit virtually any car, SUV or Van. to most aftermarket or factory roof racks. inhibitor, built to last for many years. - Eight (8) cubic feet of storage capacity. - Locks included. Passenger side opening. system make opening and closing a breeze. luggage, camping gear and more. mounts to garage or storage room ceiling. Lifts 200 lbs. - Attaches to these bike racks or any factory roof racks. Mount up to 3 bikes on your vehicle's roof rack. - Attaches these ski racks or any factory roof racks. Carry skis, snowboards or water skis on your roof rack.